Which is why today I tucked two dozen endive transplants into a double row of holes spaced fifteen inches apart in a three-foot-wide bed. And which is why, in a different bed two weeks ago, I sowed a row of Watermelon winter radishes (the resemblance to watermelon only in the color of their innards), a row of turnips, and a row of Chinese cabbage. Also, why back in March, seeds of Brussels sprouts were sown, the seedlings of which were transplanted to yet another bed last May. Not that the time has passed for planting any autumn vegetables; plenty of vegetables that enjoy the cool moistness of autumn are still to be sown. This week, I plant to sow lettuce, spring radishes, arugula, mustard, and spinach. 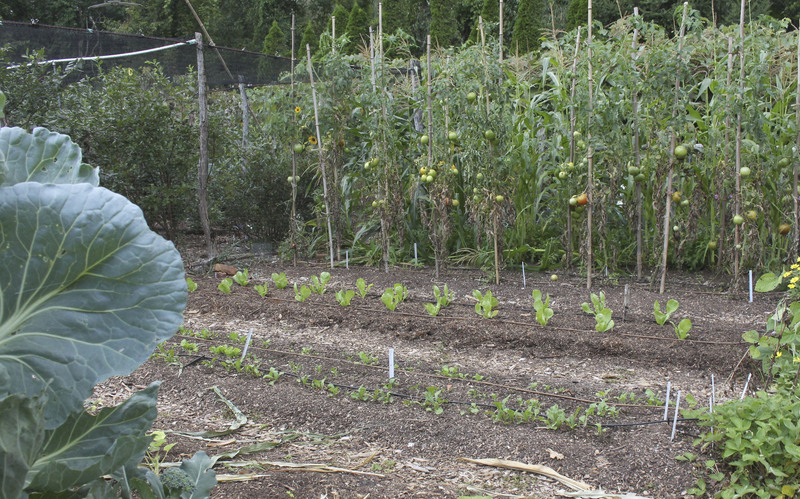 The question might arise as to where to plant all these autumn vegetables when the garden is already overflowing with summer vegetables. Overflowing, really? 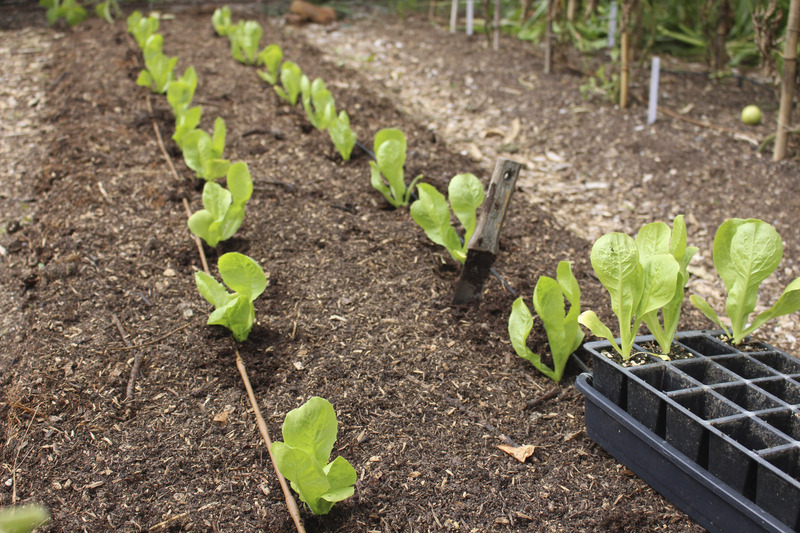 I planted the endive transplants in a bed that I had just cleared of edamame plants; edamame bear over a period of a couple of weeks and then they’re done, which they were. Likewise, a whole bed of onions and a first planting of corn are finishing up, freeing up space for planting. Even the bed from the second planting of corn will be freed up the end of August. Harvest of bush beans does not halt as abruptly as that of corn, onions, or edamame. Nonetheless, the bean harvest does begin to taper down after two or three weeks, so out went the first planting of bush beans a couple of weeks ago. A second planting, sown in a different bed three weeks after the first planting, took up the slack, and today I’m pulling even those plants out of the ground. Pole bean plants will keep green beans on our plates until frosty weather, which it what it takes to put a stop those plants. My garden isn’t only about food. I’m also sowing some flower seeds now, not to blossom in autumn but to get a jump on next spring. This past spring I sowed seeds of Apricot-Peach Parfait hollyhocks (from https://www.reneesgarden.com). Right now, the plants’ seven-foot-high spires are studded along their length with frilly blossoms in delicious shades of apricot and rosy-peach. I want more. Spires of Apricot-Peach Parfait hollyhocks add a smile to the garden. Hollyhock self-seeds so future population growth could be left to the vagaries of nature and weather. But overly diligent weeding or mulching might quash newcomers, so I’m going to sow more seeds. 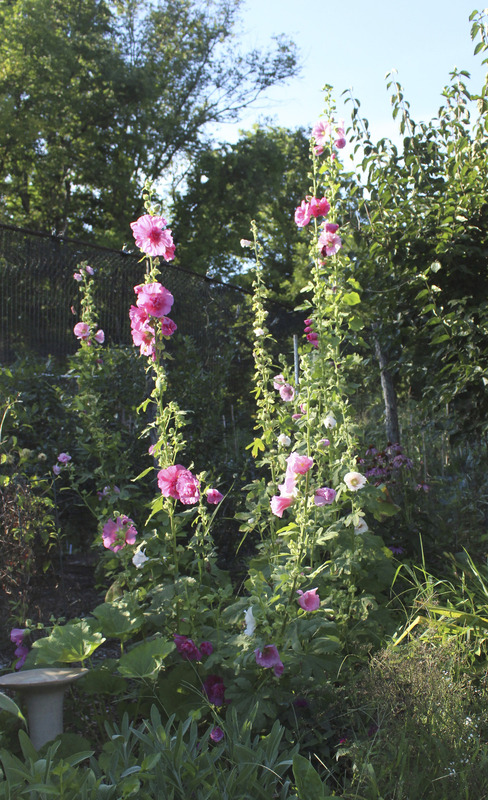 Hollyhock is a biennial or short-lived perennial so that self-seeding habit is welcome. Planting the seed in late summer guarantees that the plants will bloom next year, and earlier than spring-sown plants. Cool weather of late fall and late winter helps trigger the flowering response. Delphinium is another flower to sow this week. In addition to the advantages of enjoying spires of blue flowers earlier and more reliably next summer, delphinium seeds sprout more reliably if fresh, which they are more likely to be in autumn than the following spring. Chilling the dry seed — some sources suggest stratification, that is, chilling the moist seed — for a week or so also is said to help wake it up. Once seedlings of hollyhocks and delphiniums get going, they’ll need special accommodations to get through winter. After all, they’ll still be tender, baby plants when the weather turns frigid. The goal is to keep them alive and growing slowly going into winter. I’ll either tuck the pots close together in the cold frame or in the slightly warmer large window in my barely heated basement. This entry was posted in Gardening, Planning, Vegetables and tagged autumn, delphinium, endive, fall, fall vegetables, hollyhock, radishes, reneesgarden.com, tomatoes. Bookmark the permalink. Trackbacks are closed, but you can post a comment. What did you do to prepare the beds before planting the fall plants? Very interesting article! I am very glad that I found this article! Thanks for sharing!